This past weekend found us busy with weddings, the first at CJs Off the Square in Franklin. Ann and Justin were married to a program of decidedly nontraditional selections. We brought mothers in to Norah Jones’ laid back “Come Away With Me”. Since there were no attendants we immediately segued to George Harrison’s “Something” for Ann’s trip down the aisle. After the ceremony husband and wife exited to Muse’ “Starlight”. We kept the cool tunes coming for the reception with Julianna Waller adding tasty improv in all the right places. Congratulations and many happy years together to Ann and Justin. 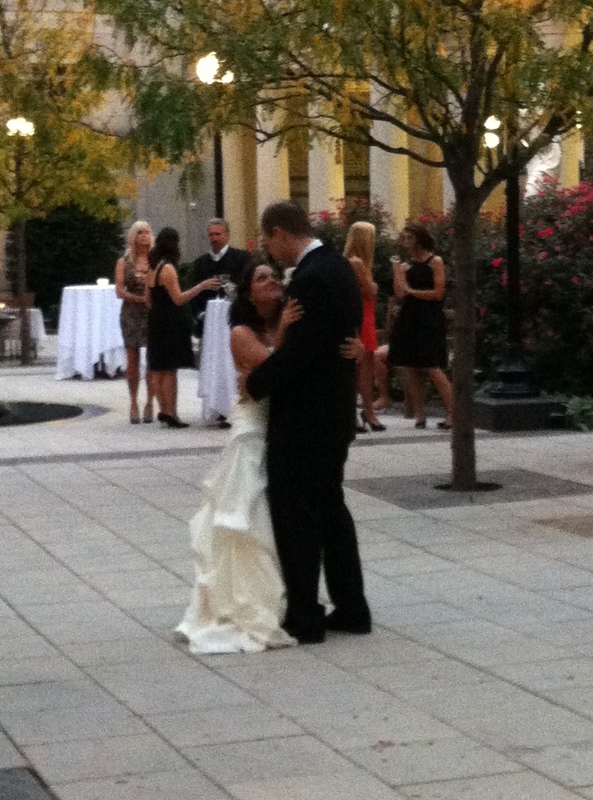 Saturday found us once again at the Schermerhorn Courtyard for the elegant wedding of Megan and Preston. The perfect weather along with the choice of lovely classics made a beautiful background for the combining of families. After Megan and Preston were “Signed, Sealed, Delivered” we musicians let our classical hair down to play fun stuff for the cocktail hour. Congratulations to Megan and Preston and their families. Decompressing from a very busy weekend. We started off with a wedding at CJs Off the Square in Franklin Friday evening. When we saw Amy Parman, who was coordinating that evening, outfitted in cowboy boots, we decided to add Josh Turner’s “Would You Go With Me” to the prelude lineup. Lori Beth and Trey had chosen “Going to Carolina in My Mind” to bring in mothers and grandmothers, then back to tradition with Canon in D for the attendants and the very traditional “Wedding March” for Lori Beth’s entrance. As often as we play “All You Need Is Love” for a recessional I’m beginning to think it should be classified as traditional. Congratulations to the happy couple and their families. The next day found a permutation of Silver Strings once again at CJs. Lauren and Nick were married in a lovely ceremony with a friend, Meredith, singing the lovely and most appropriate “Ruth’s Song” after rings were exchanged. They opted for a more traditional selection of hymns and classics for their prelude and processionals. Another permutation of Silver Strings was found at Owen’s Chapel just south of Brentwood playing for Grace Anne and Braiton’s wedding and reception. They also chose classical music for the prelude and processionals but then allowed the trio to let their hair down for the reception with Beatles and standards. 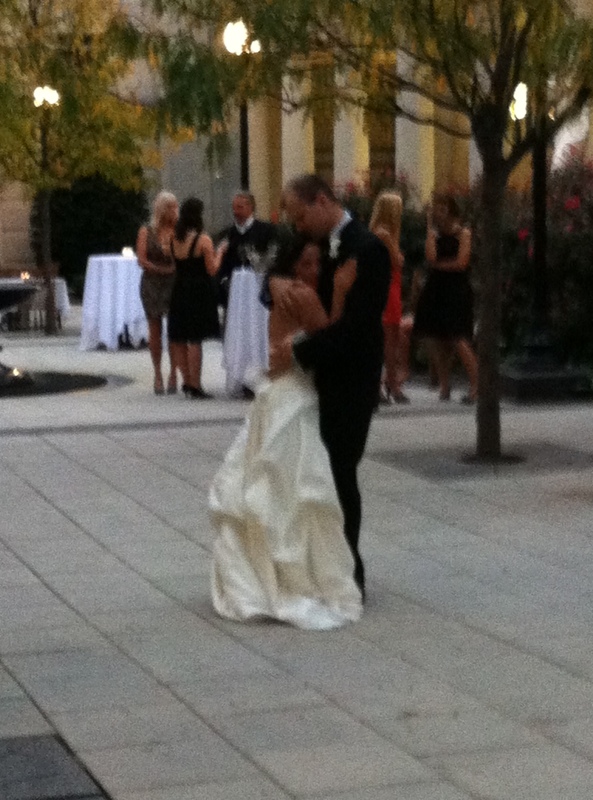 On request we performed Elton John’s “Tiny Dancer”, a favorite of Grace Anne. The children seemed to have a great time dancing to whatever we played. Meanwhile across town vocalist, Sandy Merrill, and pianist, Mark Beall, presided over the decidedly nontraditional choice of music for the wedding of the daughter of an acquaintance of Sandy’s to her beloved. Sandy sang “As Time Goes By” for the mothers and grandmothers, “How Beautiful” for the attendants (ok, so this one was sort of traditional). Mark brought the bride in to “Kisses and Cake” and as the parting recessional Sandy belted out R&B soul man Sean Hayes’ “Powerful Stuff”. Sandy and Mark then dashed to the fellowship hall to entertain the guests with jazz standards during the reception. Congratulations and wishes for many happy years together to all the newlyweds. Sunday afternoon found us at the Schermerhorn again bringing the music this time for Ken and Stephanie’s wedding. It was an elegant but fun affair with Dobby, the dog, sporting a bow tie as ringbearer. Ken, dashing in his tux, awaited his bride as Stephanie, gorgeous in her off-white gown, failed in her effort to walk more slowly down the aisle to the Canon in D so ready was she to marry her true love. This was the culmination of an 8 year courtship for them and it was abundantly clear they were made for each other. They wrote their own vows with a friend presiding over their recitation. After the ceremony Silver Strings played for the cocktail hour but got to watch Ken and Stephanie’s first dance to Dylan’s “To Make You Feel My Love” recorded by Garth Brooks. My pictures below make it clear why it’s best to have a professional photographer. Congratulations to Stephanie and Ken.